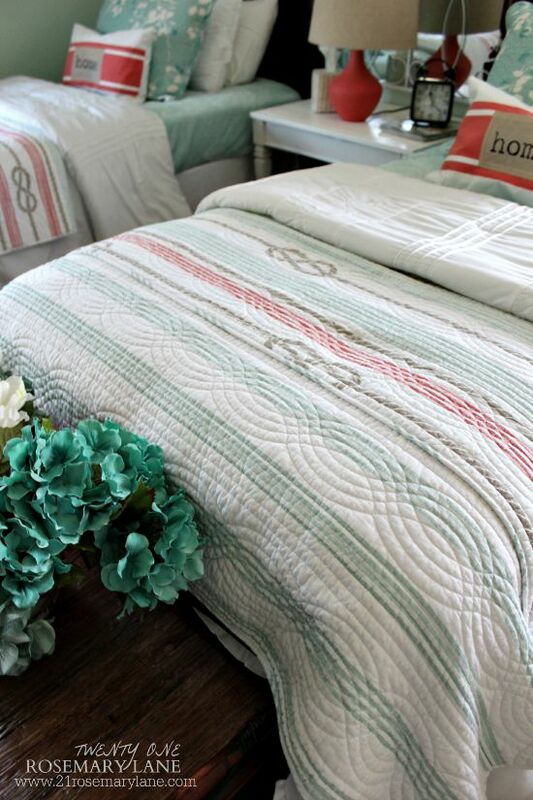 Since I knew this summer I was going to have several overnight stays in the way of family and friends, I decided to lighten up and brighten up our guest bedroom with some pretty new linens. Both the throws on the bed and the decorative pillows are from my favorite store, and I am sure one of yours as well, Home Goods. 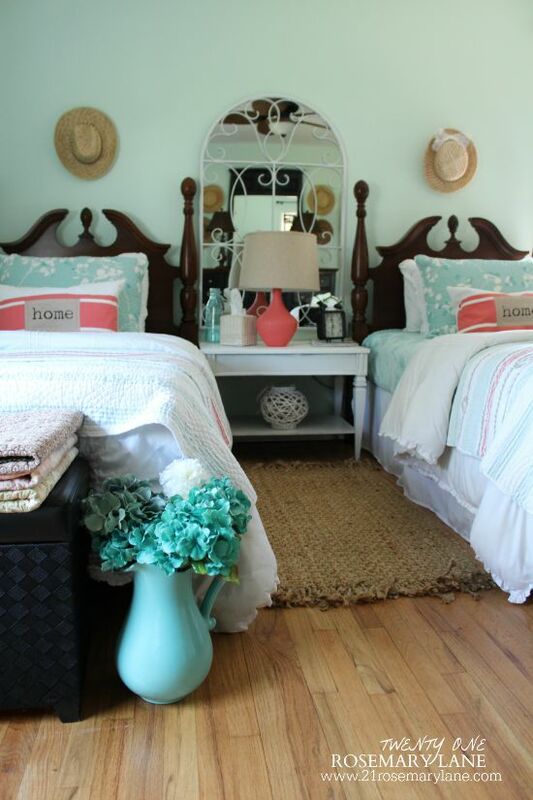 I painted the mirror's metal frame in white and hung darling thrift shop hats over each of the beds. Then I switched out the dark night table for a lighter painted piece. I also painted the base of an old lamp in a salmon color, although I am rethinking that color choice. And the heavy wool area rug was removed to expose the much lighter hardwood floors. Just a few simple changes really gives this space a nice summer feel. Wow...I find it hard to believe that there are only 20 more days until the kids are back to school and then bam right into the hustle and bustle of the autumn's almost never ending slew of activities. Hope you all are enjoying the last few weeks of these lazy hazy summer days! Oh that is gorgeous, I love it! Please dont change that salmon lamp....!! That "tater" salad from yesterday looks yummy, i'm going to give it a try! It looks so inviting, Barbara. I think your color choice gives it that light and airy feeling. LOVE IT!!! It looks so pretty Barbara! Oh I love your guest room. I need to come for a virtual sleepover! I came over from your Apple post from last year it was on Pinterest. I wanted to invite you to my Fall party. I know your gearing up so come on by and link. Feel free to link your Home Tour. Love to have you. 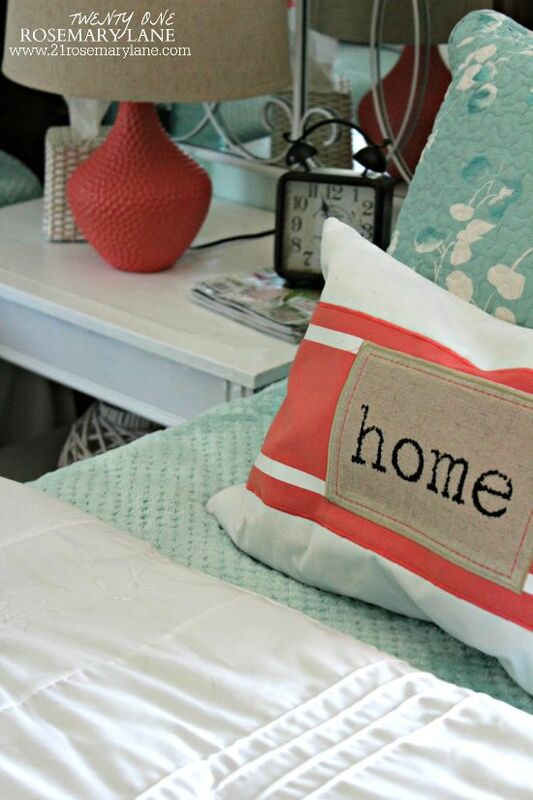 The lamp picks up the color in your pillows - looks good. 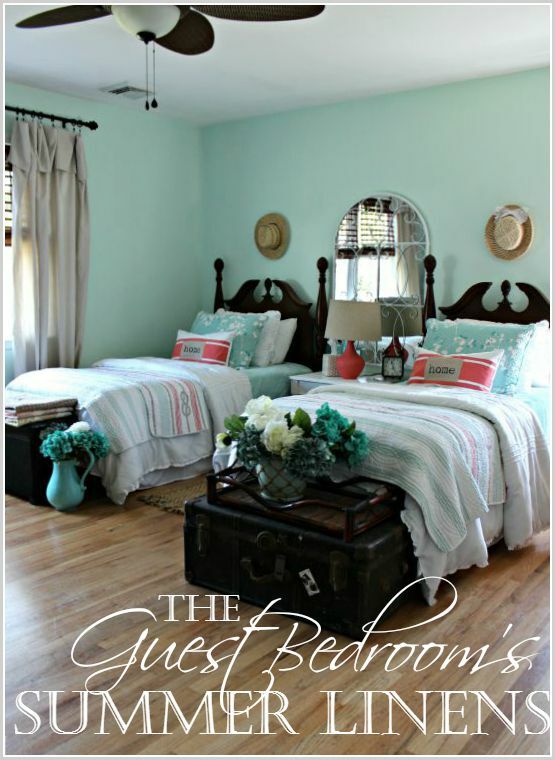 You really did a wonderful job on the guest bedroom. Are you taking reservations? 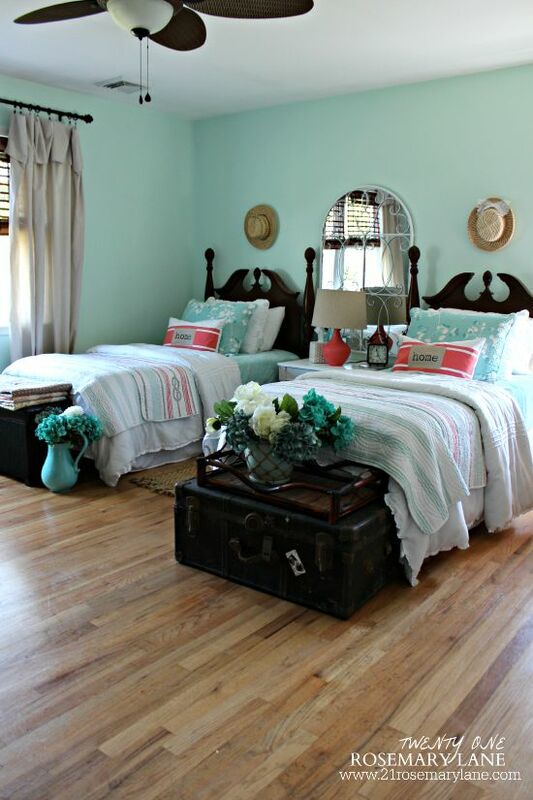 I love the room and it's soft summery colors. Perhaps a dry brush technique of white over the coral lamp base would beach it up a little and make it look more like the stripe in the bedding. Just an idea, although. Like it like it is. 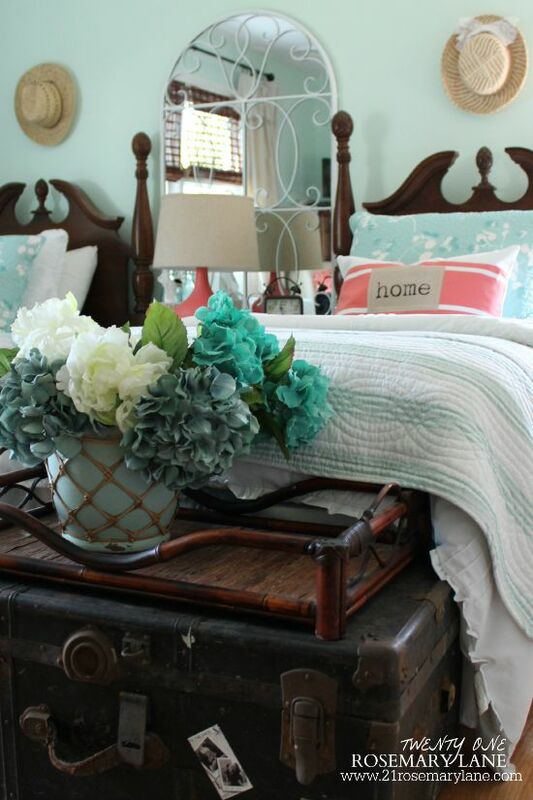 Love this guest room and the pretty linens with the wall color. I am sure your guests are quite comfy.